Granger Construction was selected for complete replacement of the Emergency Department including separate entrances for adult and pediatric patients and visitors, sized for 100,000 visits per year. The new emergency facility was constructed adjacent to the main entrance to the hospital which incorporates the old main entrance area into the new emergency department, never restricting access to patients, staff or visitors. Construction efforts also involved a new 10,000 SF main lobby including a drop-off canopy, which radically changed the facade of the campus. Project included renovation of original Emergency Department into a 12 bed Clinical Decision Unit. As the Level I Trauma Center for the region, these upgrades significantly increased the quality of care for the residents. 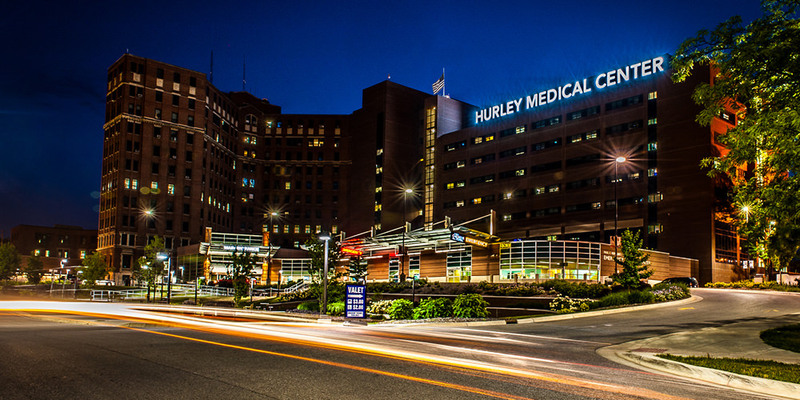 Granger Construction delivered all three Phases of the project ahead of schedule as well as delivering this GMP project under budget, returning $160,000 to Hurley Medical Center.